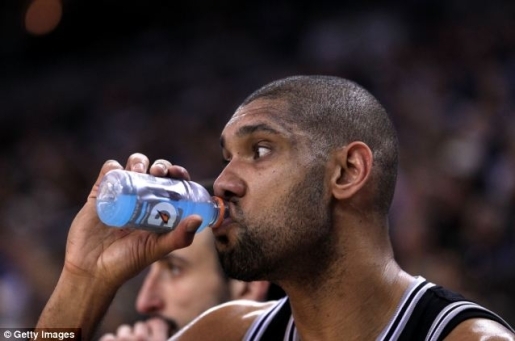 Tim Duncan enjoys a delicious Gatorade. Pepsi is making a change in direct response to a Change.org petition uploaded by a teenager from Mississippi. When 15-year-old Sarah Kavanagh took a glance at the ingredients of Gatorade to see if she could continue to drink the energy drink while on a vegan diet, the ingredient bromiated vegetable oil stood out to her. BVO, described by Gatorade owner PepsiCo as an emusifier to spread flavors evenly throughout a drink, is also considered a flame retardant in the European Union and in China. Bowing to pressure, but not admitting it’s due to the petition, Pepsi is removing BVO from Gatorade. While BVO may not be especially harmful, when you consider the fact it’s just vegetable oil, this is a great time to tinker with your ingredients while everyone is distracted by fatal energy drinks full of dangerous ingredients. Compared to murderous Monster and other more potent beverages, a little veggie oil is practically nothing and nobody had to file any lawsuits to get the ingredients list changed. There’s no word on whether or not Pepsi (and Coke) will pull BVO from their other drinks with the substance, including Fanta, Mountain Dew, and Powerade.